When Creston’s Therapeutic Riding Program puts out the call for donations to its annual Art Trot, the community responds quickly. The event, which runs March 3 and 4, started as a simple art auction, held at a former downtown gallery and conceived by local financial advisor Kerry Ross. “He basically donated all the art to the auction,” says Whiteaway. Art Trot has expanded from 28 items the first year to over 100, including quilts, gift certificates and small furniture, and is now held in the Erickson Room at the Creston and District Community Complex. For the past two years, a birdhouse decorating competition, a collaboration with the Creston and District Society for Community Living (CDSCL) wood shop, has been popular, with 85 entries in 2017. With help of Comfort Welding, Speedy Glass and Home Hardware Building Centre, this year’s contest features more complex birdfeeders. It’s a key fundraiser for the CDSCL’s Therapeutic Riding Program (TRP), which has an annual budget of about $130,000 — with about $23,000 collected in lesson fees, the rest has to be made up with grants, donations and fundraising. That ensures fees stay low, at about $20 per lesson. 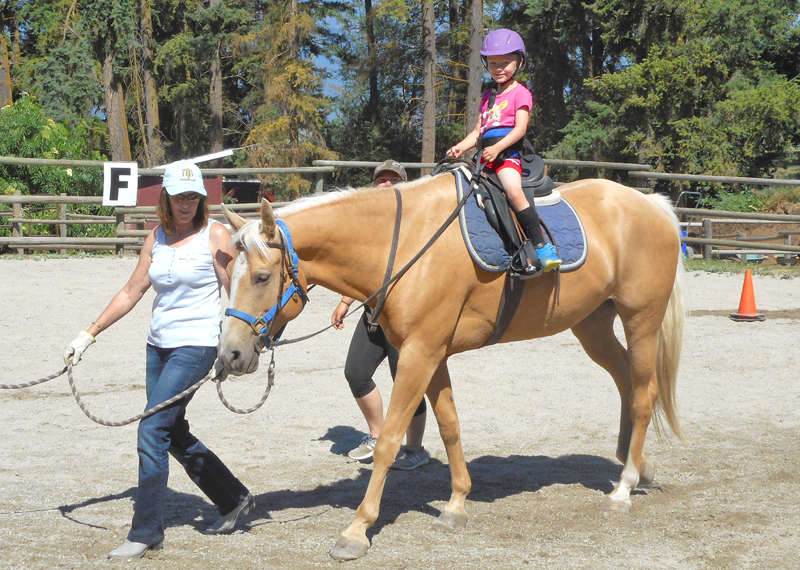 Promoted as “more than just a pony ride”, the program teaches riders with a disability to ride as independently as possible, improving balance and co-ordination, and earn a sense of accomplishment as they discover freedom, responsibility and dignity. The TRP, a Canadian Therapeutic Riding Association (CanTRA) member, started in 2005 under the direction of Sarah Schmidt, who “left the program in shape to succeed,” says Whiteaway, who took over as program director in 2008. She became a CanTRA-certified instructor a year later, and now teaches with head instructor Christine Ross. Whiteaway, who grew up on the south shore of Montreal, was familiar with therapeutic riding before moving to Creston in 2005. She volunteered with a program near Redmond, Wash., where she lived for nine years while working as a software engineer, which made her long for a change of pace, leading her to the Kootenays. Now, she spends much of her working life outdoors at the TRP’s facility at 849 Erickson St., on the former Endicott Centre grounds, now the home of the Kootenay Region Association for Community Living’s Spectrum Farms. Therapeutic riding runs April through October, with eight-week sessions in the spring and fall, and a five-week session each summer. It’s the only program of its kind between Kelowna and Lethbridge, so riders come from around the Kootenays to participate, with up to 63 rides each week. With that many riders, volunteers are key to keeping the TRP running smoothly; depending on a rider’s ability, up to five volunteers may be required during a lesson. There are no specialists, such as physiotherapists, occupational therapists or mental health workers, on staff, although they are consulted as needed. None of it would be possible without the community’s financial support, which keeps riders riding and sustains the herd of nine working horses and the 29-year-old Blue, who was retired five years ago and now serves as “herd supervisor”. “From my perspective, when I was growing up, access to horses was difficult,” says Whiteaway. “You had to have lots of money, and you had to go once a week for a riding lesson. •To learn more about the Therapeutic Riding Program, visit www.cdscl.com/trp.htm. Donations to Art Trot can be dropped off at the CDSCL or Edward Jones offices.